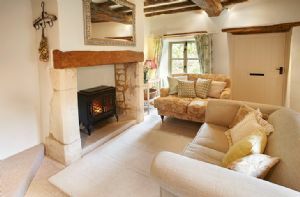 This 250 year old cottage in a quiet corner of Bourton-on-the-Hill, with many original features, has been extensively refurbished and features a beautiful cottage style garden. It offers lovely views across miles of rolling Cotswold countryside. This stone cottage is an imaginative conversion of one of the original Chatsworth Estate reading rooms. In the charming village of Wetton close to Dovedale, it offers some of the most attractive walks in the Peak District National Park. One of the Ty-Howell farm cottages, this delightful property features open plan kitchen/sitting/ dining room with its own patio. It has a double bedroom with 5' zip and link bed (can be two singles upon request) with shower room, underfloor heating and electric flame effect wood burning stove. This delightful property Pavilion, in Idbury near Stow-on-the-Wold, has unrivalled south-facing views of the beautiful rolling Cotswold countryside. French windows running the length of the property give a panoramic view across farmland and forests. Vine Cottage is a delightful, semi-detached, 200-year-old cottage with a private enclosed garden with a charming rustic and authentic personality.